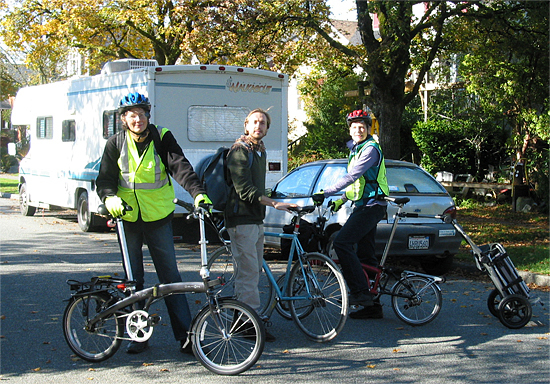 We three caravanned by bike to a nearby garden he cultivates on a residential street. He tends two planter boxes in the boulevard (the strip between sidewalk and curb), and a long bed inside a low ironwork fence in the front yard. I taste-tested my way among leafy sorrel (very lemony), shiso (flavorful Japanese leaf) and delicious sweet carrots. Beside them were end-of-season beans and sunflowers left for the birds, plus winter kale and broccoli. We biked on to his guerrilla garden near the Pine Street community garden. In the latter, organizations and individuals can rent a space for their garden between a street and an unused railroad track. (This garden strip along the railroad track is many blocks long). Gabriel and collaborator Lulu created a guerilla garden beyond the community garden between a concrete building and a planned city park. Gabriel built planter boxes from lumber discarded and dragged over from nearby high-rise construction. The boxes were planted with veggies, squash and raspberries. But this produce doesn’t go to Gabriel’s CSA customers. It is shared by the gardeners, who frequently offer it to passers-by walking along the trail beside the railway.